I don't normally do this, but I'm going to make an exception in this case. 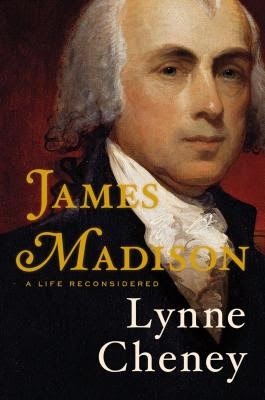 Viking has just released a new biography on American President James Madison by Lynne Cheney that I am curious to read. They offered to send a copy my direction in order to facilitate a review and the copy is on its way. They also offered to give away a copy of this book to one of you in the next week. Now, to be perfectly clear, I haven't read this book yet. Normally I never offer a review and/or a giveaway on a book I have not yet read for myself. However, in the case of James Madison: A Life Reconsidered , I'll make an exception because I like history, biography and non-fiction so whatever the contents of the book I have a feeling I'll find it curious and satisfying. I do plan on reading this and I'm taking the opportunity to host the giveaway for the benefit of one other person out there. THIS CONTEST IS NOW CLOSED. The winner, as selected by random.org, is #13 - Sarah! Congrats! Many thanks to Viking and Penguin Groups for this offer. I know next to nothing about Madison, so I would love to read this. This would be a great read and share with my dad! I've seen this book mentioned on goodreads and have it on my list to read. I would love to win it. Yes! I'd love to win! I've been slowly working through presidential biographies. I'd love to read this! I'm interested! I've been looking for a new biography to read. I love biographies, so I would really enjoy reading this one on Madison. My husband would enjoy it too. Thanks for having the giveaway.